On more than one occasion, someone has mentioned how they didn't spot a thread because they rarely check a certain subforum. and it's hard to tell when there's been an update without focusing one's eyes. and use a thick separator in-between forums? You know, now that I think about it, I'm excited. I think it should be fused into Evangelion Chit-Chat (which would be renamed Evangelion General). Last edited by deeRez on Mon Feb 26, 2018 4:30 pm, edited 1 time in total. I must admit that when I tried to introduce subforums like the ones here at another forum, I got huge resistance. My reason was that I prefer to have all (or most) of the forums visible on a screen rather than having to scroll up and down all the time to get to them (another way to miss things!). But in any case I suggest simply using the "unread posts" menu item, because that way you don't need to miss anything! Go through the list reading the ones that interest you, and then click "mark all read" at the top of the list to clear it ready for your next visit (but refresh the list first in case something new that you're interested in has come up). Chit-Chat being such a cluttered dumpster is one of the reasons Everything Else Evangelion was made in the first place. My brain is currently in such a clutter that I have nothing else useful to say right this moment. OP I agree on your suggestions. I don't think "Chit-Chat" and "Everything Else Evangelion" have a real reason to be two different subforums. Chit-Chat for example has a recent topic about Sadamoto's manga and mostly lighthearted content, while Everything Else Evangelion is basically the "merchandising + localization" subforum. Maybe having them united in a "General" subforum would work better. Better to have one active subforum instead of two semi-active subforums, I think. "Evangelion Discussion" should be renamed into "Neon Genesis Evangelion Discussions", the actual name and description make it the place to go for in-depth discussions from both NGE and Rebuild. "Rebuild of Evangelion" should be "Rebuild of Evangelion Discussions" and I would change the name of "Evangelion Final [SPOILERS]" into something more clear, like "Evangelion Final news and speculations". I don't think "[SPOILERS]" really serves a purpose anymore. 3.0 is 6 years old, and obviously speculations on the final movie will contain spoilers on the first 3 movies. The current division looks a bit dated I must admit, very "early '10s". Joseki wrote: "Evangelion Discussion" should be renamed into "Neon Genesis Evangelion Discussions", the actual name and description make it the place to go for in-depth discussions from both NGE and Rebuild. Renaming it as you suggest would actually exclude the new movies more definitively than the current naming scheme does, since the movies have never at any point used N.G. in their titles. I also don't see any purpose to retaining a separate Rebuild discussion board while simultaneously making Discussion explicitly open to Rebuild stuff. Either one way or the other. Probably I didn't express myself clearly, but what I wanted to say is that right now Evangelion Discussion's description makes the subforum open to both NGE+Rebuild discussions, but the topics in there are only about NGE, so let's change the name and description to make it the NGE subforum. Rebuild stuff will still go in Rebuild Discussion and general discussions on Evangelion as a whole on the new "general" subforum. I've pondered this before, and I know NemZ did as well. I agree that it's a good idea to rebrand "Evangelion Discussion" to make it clear that it's specific to the original series. "Neon Genesis Discussion" seems appropriate, as that's how it's listed on the official Evangelion site's frontpage (as opposed to the full "Neon Genesis Evangelion" title, saves on text space). I'm not sure how I feel about opening the floodgates of Rebuild material into other forums (like "Chit-Chat"), especially with 3.0+1.0 still around the corner. Once we get closer to the film's release, expect a spoiler ban. It's simply easier contain all the Rebuild stuff in one forum, currently. As for mixing "Chit-Chat" and "Everything Else", I also find myself leaning toward agreement. If anything, "Everything Else" should be broken up between what's actually tangentially related to Eva (interviews, games, merch), while the rest can be redistributed (like Shin Godzilla goes to "Film and TV"), and then stick "Everything Else" into a subforum under Chit-Chat along with "Fandom". -Everything Else Evangelion (non-Eva works by related people should be redistributed to relevant forums. IE, Shin Godzilla goes in Film/TV, etc). This provides for discussion of common themes which can be illustrated from each and any part of the franchise, as well as those specific to one part, or at least clearly differently handled in them. I don't think the manga generates so many posts and topics to needs its own subforum, especially now that it's done and dusted. Joseki wrote: I don't think the manga generates so many posts and topics to needs its own subforum, especially now that it's done and dusted. Niiice. I like it. I like it a lot. * Putting Discussion above Chit-Chat. * Renaming "Evangelion Discussion" to clearly indicate that it's NGE-specific, and making it a sub-board of a (new) "Evangelion Discussion" parent-board alongside dedicated sub-boards for Rebuild and whatever other divisions we think are relevant. Such an organization gives cross-subfranchise discussion a natural home in the parent board. * Eliminating Related Works & People and moving its content into Off-Topic, because, really, it is off-topic to an Evangelion board. * Promoting what are currently subfora to equal visibility alongside their parent boards so that traffic will not be biased towards the highly-visible parent boards. "Off-Topic" would be renamed "Off-Topic General", etc, but its subcategories would still be grouped together with it under a "Completely and Utterly Off-Topic" heading the way all of the "EvaGeeks Forums" are grouped together right now as the "EvaGeeks Forums". I'm open to argument about the last one, but I'm all but set on the rest. I love the idea of grouping all Discussion together under one common heading, because that's how the site already operates in practice: We may call it "Evangelion Discussion" as if it covered the whole metafranchise but it is totally the "NGE Discussion" board, and we may call it the "Rebuild" forum but it's totally the "Rebuild Discussion" board. They may as well exist together under a common heading the parent board of which can be where cross-franchise discussion that doesn't cleanly fit into the more specific discussion boards can go. 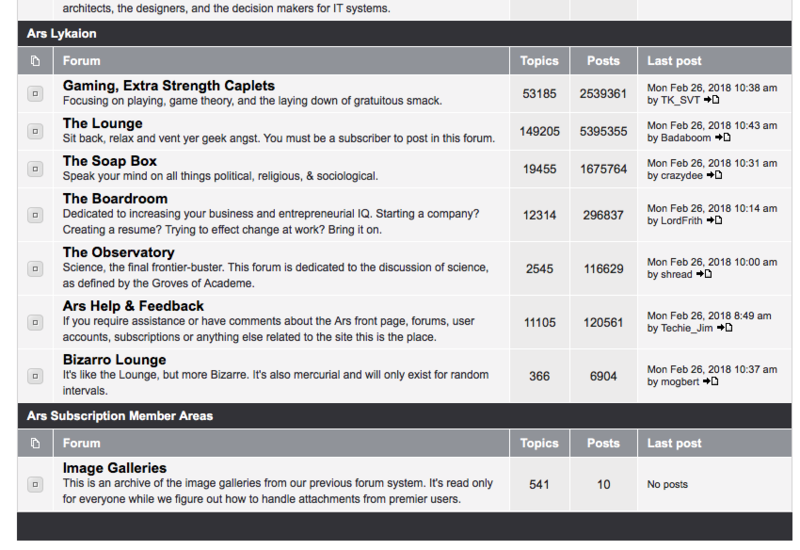 We took some time backstage to come up with a new forum structure incorporating suggestions from this topic. We present it here for public comment. Further suggestions are welcome. The proposed reorganization is as follows. The bolded names are categories, not actual boards, and the names preceded by "+" signs in trailing parentheses are sub-boards. * As you can see, we're bumping up most of the subforums to "main" forums to boost their visibility and making more use of the software's category feature to keep a high-level grouping among them. * The names are still very much in flux. "Original NGE Discussion" in particular is pure placeholder; originally we were going to title it "Neon Genesis Discussion" but then it occurred to me that "Neon Genesis Evangelion" is not a unique moniker because it's also the official title of the manga. Other titles we considered for it include "Original Series Discussion" and "TV Series + EoE Discussion". * Some name changes that are more set in stone include "Fan Works" (formerly "Fandom Area"), "Related People and What They're Doing" (formerly "Related Works & People"), and "Wiki Editorium" (formerly "The Editorium"). * "Fandom Area" was renamed to "Fan Works" to better express its purpose. "Fandom Area" was deemed insufficiently evocative of this; after all, isn't the entire site a "fandom area"? * "Related Works & People" is getting more than a name change. In its new incarnation as "Related People and What They're Doing", its intent is to be a place for news and interviews about related people, but not discussion of the works themselves; such topics (e.g. Shin Godzilla) now belong in their relevant Off-Topic subforums (e.g. Film and Video in the case of Shin Godzilla). * "The Editorium" was renamed to "Wiki Editorium" to better emphasize its relationship to the wiki, which is otherwise not obvious. It was also moved to be under the Discussion label to try to draw activity to it and emphasize its relationship to the Discussion forums. * "Everything Else Evangelion" was renamed to "Merchandise and Manga" so you don't have to read its description to remind yourself what's in it. Its former name has instead been repurposed as a category name because nothing really unifies all the non-Discussion forums besides the fact that they're not Discussion forums, and the major distinction we care about in organizing the forums at this top level is keeping the Discussion forums separate from... everything else. * The new forum "Evangelion General Discussion" (also a placeholder name) is where in-depth analysis, theories, and discussion of both the metafranchise and the "lesser" canons such as the manga go. Its order in the listing is deliberate so that users' eyes will have to pass over the more specific forums first. Monk Ed wrote: * As you can see, we're bumping up most of the subforums to "main" forums to boost their visibility and making more use of the software's category feature to keep a high-level grouping among them. Whoo, I'm excited for the subforums gaining visibility now. Monk Ed wrote: * "Everything Else Evangelion" was renamed to "Merchandise and Manga" so you don't have to read its description to remind yourself what's in it. Its former name has instead been repurposed as a category name because nothing really unifies all the non-Discussion forums besides the fact that they're not Discussion forums, and the major distinction we care about in organizing the forums at this top level is keeping the Discussion forums separate from... everything else. What about the Evangelion video games and the art books? This leads me to suggest calling it "Merchandise, Media, and Books". Monk Ed wrote: * The names are still very much in flux. "Original NGE Discussion" in particular is pure placeholder; originally we were going to title it "Neon Genesis Discussion" but then it occurred to me that "Neon Genesis Evangelion" is not a unique moniker because it's also the official title of the manga. Other titles we considered for it include "Original Series Discussion" and "TV Series + EoE Discussion". Something gets me about the NGE acronym and the word Original... it feels unnatural. I think it's fine to call it Neon Genesis Discussion, and just explain it in the description as TV Series OA/DC + EoE. Though I have a problem with the word Discussion, since when you Discuss a character's hair color, it's still a form of Discussion, but it doesn't qualify for this forum, which is why it confuses me... maybe a stronger word to denote more effort is warranted to discuss things here? Monk Ed wrote: * The new forum "Evangelion General Discussion" (also a placeholder name) is where in-depth analysis, theories, and discussion of both the metafranchise and the "lesser" canons such as the manga go. Its order in the listing is deliberate so that users' eyes will have to pass over the more specific forums first. and the word "General" is too loose. How about, Spin-Off Media Analysis? Monk Ed wrote: * Some name changes that are more set in stone include "Fan Works" (formerly "Fandom Area"), "Related People and What They're Doing" (formerly "Related Works & People"), and "Wiki Editorium" (formerly "The Editorium"). The reasoning for all three sounds solid. Though, as a side-note: The Dr. Who forums call their "Fan Works" forum "Fan creativity" ... I don't know ... creativity to me sounds much more pleasing/soothing now that I think about it, but that's just me. OOh, and I would highly suggest ordering Fan Works directly under Evangelion Chit-Chat. I very much like the new structure, but there is one thing that I would change: A seperate subforum in Eva Discussion for the Manga and Anima, seeing how they are a bit too big to be a "lesser" canon (at least to me), and leave the "General Discussion" subforum to canons like SIRP, Angelic Days, Battle Orchestra, Girlfirend of Steel, etc.